Calling all taco lovers! 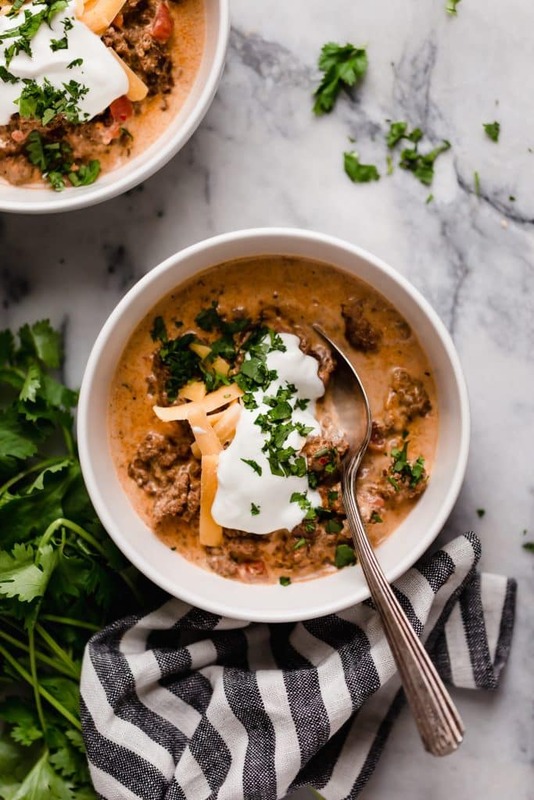 Are you ready for a low-carb, keto, gluten-free, nut-free, egg-free taco SOUP?! 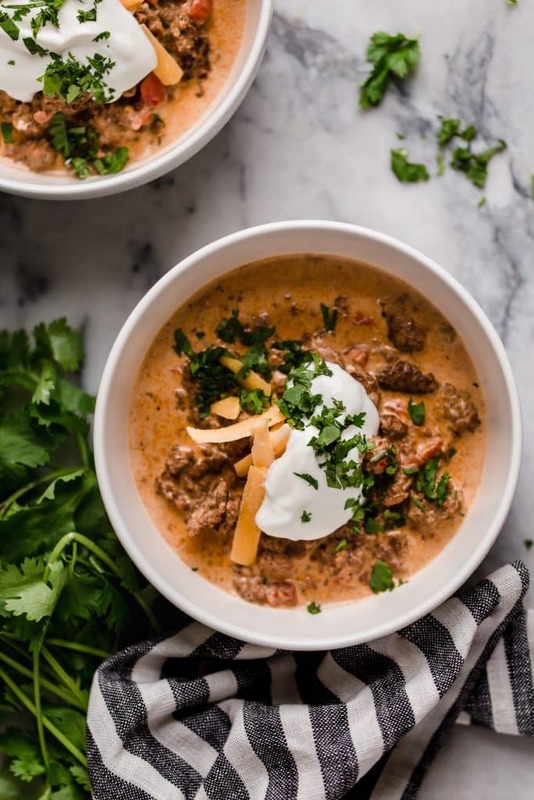 This dish combines ground beef, cream cheese, diced tomatoes and other tasty ingredients to create the most delicious, flavorful soup! Are you a lover of all things tacos? If so, get ready because this soup is going to absolutely blow you away! 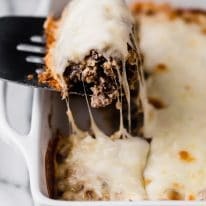 One of the best parts about this dish is that it is made using a SLOW COOKER, meaning it is almost altogether “hands-off cooking!” I love cooking with my slow cooker because it basically does all of the work for me! 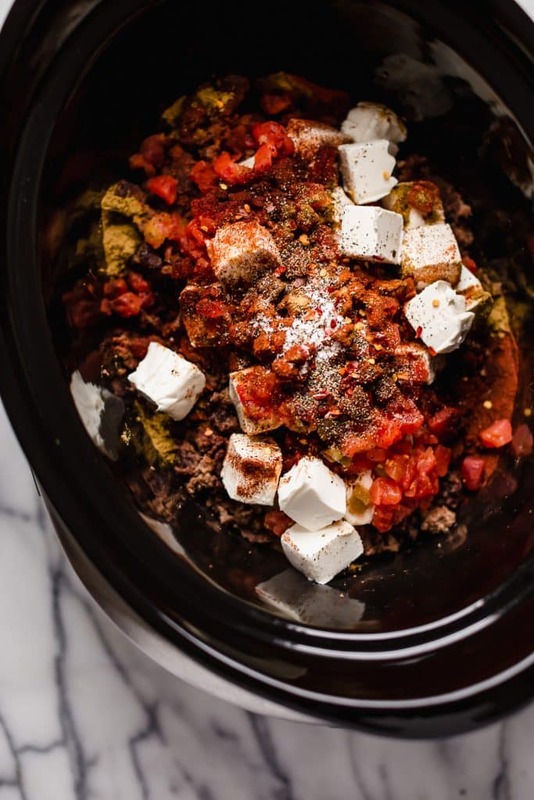 Did you know slow cookers bring out the flavors of foods?! It’s true. Using a slow cooker can actually help your dishes taste even BETTER! Cooking meals “low and slow” allows the flavors to really blend together to result in a drool-worthy meal! The ingredients in this low carb taco soup are SO delicious. On top of being yummy, they provide some pretty awesome health benefits too! Beef Broth: Beef broth is JAM packed with SO many nutrients! It is full of collagen, which improves skins and joints. On top of that, it’s a great source of glycine, an amino acid in charge of creating mental clarity and reducing stress! Green Chiles: This delicious, flavor-boosting veggie is full of Vitamin B6, iron, and copper, and it helps to keep your skin healthy while also aiding in digestion. Paprika: Paprika is full of Vitamin E, which means it helps to produce red blood cells. In addition, it is a great source of iron and can help prevent hair loss! This taco soup is one of my favorite slow cooker dishes to make. It is super quick and easy to whip up, as prep time only requires 20 minutes. After that, you stick it in the slow cooker and the rest of the work is done for you! Do I need to add water to my slow cooker meals? Not this one! 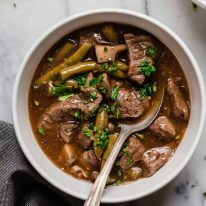 Though that may sometimes be necessary, this dish uses beef broth which does the trick just fine. Can I use a slow cooker with raw meat? Sometimes, yes. For this particular recipe, I recommend browning the beef before putting it into the cooker. Don’t worry, it only takes a couple of extra minutes! Do slow cookers destroy the health benefits of the different ingredients? Nope! Not at all. Slow cookers use less heat than other cooking options (stove top, oven, microwave, etc. ), which means they actually work to preserve the nutrients. How do I store slow cooker soups? 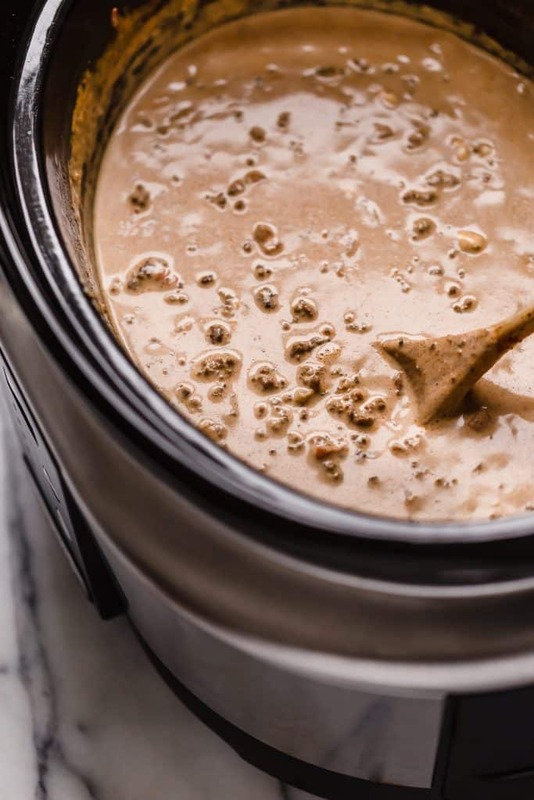 While it depends on the recipe, it is generally suggested to store slow cooker soups in an airtight container in the refrigerator and eat the soup within 5 days, reheating on the stovetop before eating. If you plan to eat it much later, you can store the soup in an airtight contain without garnishes in the freezer and, before eating, thaw it completely before reheating on the stovetop. The soup will stay fresh in the freezer for up to 2 months. In a large pan over medium heat, cook ground beef until browned. Drain excess grease. 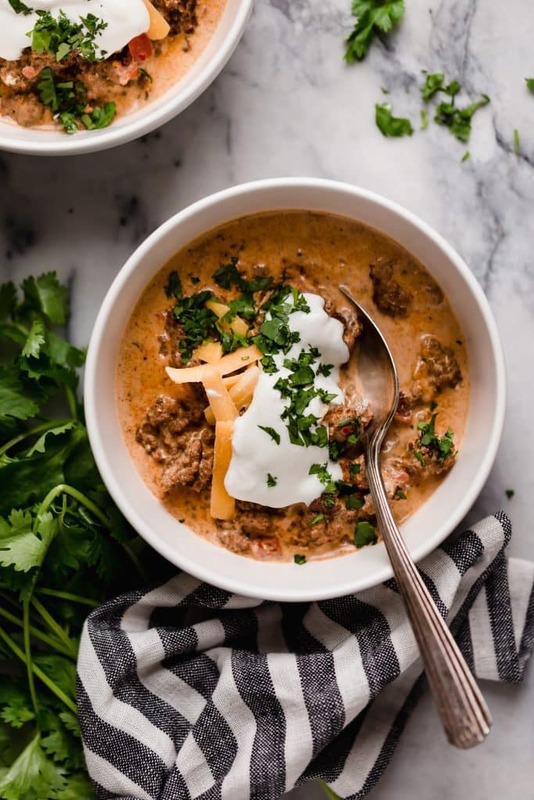 To slow cooker, add browned ground beef, cubed cream cheese, canned tomatoes with green chiles, chili powder, cumin, paprika, pepper, salt, and red pepper flakes. Stir to combine ingredients. Add beef broth and heavy cream and stir again. After cooking, stir the taco soup before serving in bowls. Garnish with desired toppings and enjoy! 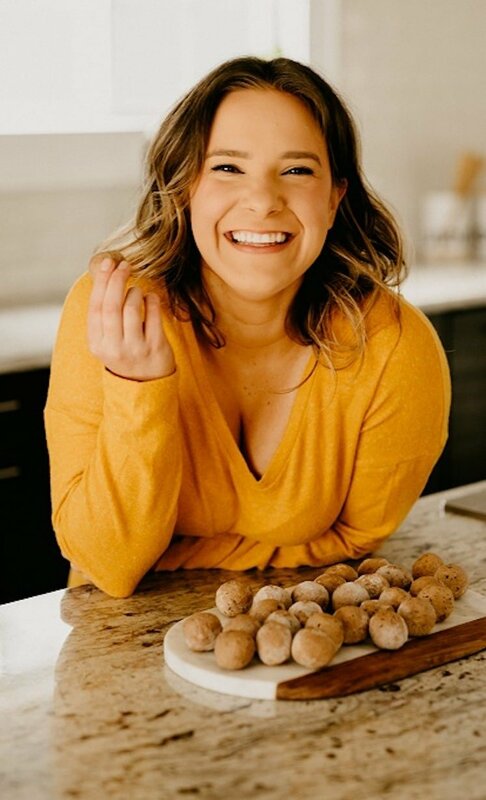 Compliant with a BUNCH of recipes! 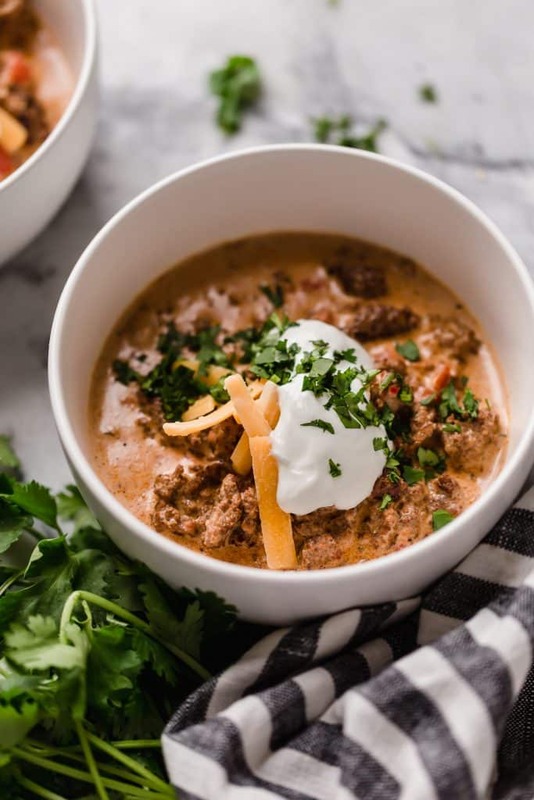 Keto and Low-Carb: With only 4.3 grams of net carbs per serving, this taco soup is PERFECT for the ketogenic diet! Primal: The ingredients in this recipe follow primal guidelines. 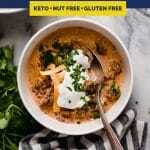 Gluten-Free: Free of wheat, barley, rye, and other gluten-containing products, this meal is safe to consume for those with Celiac and other gluten intolerances. Grain-Free: This low carb taco soup recipe is completely free of grains. 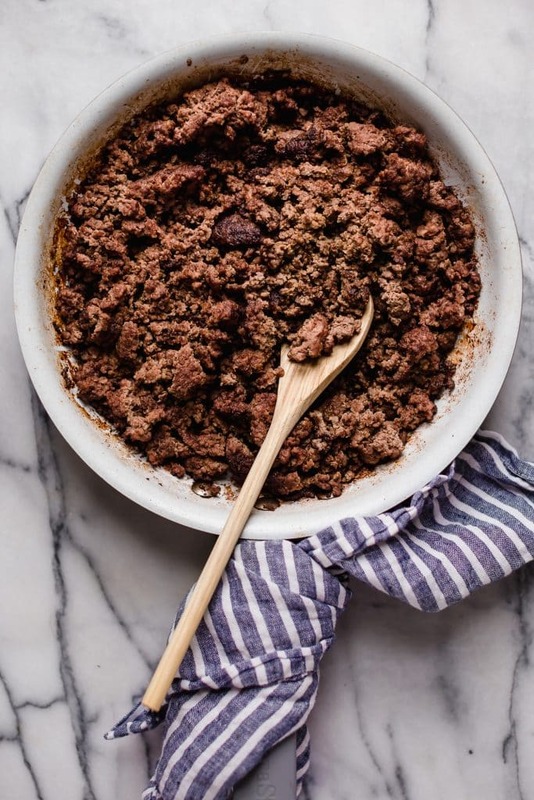 Nut-Free: There are no peanuts or tree nuts used within this recipe. Egg-Free: This slow cooker taco soup does not require the use of eggs. Sugar-Free: Sugar and sweeteners are not present in this soup. Looking to dig in to some more soup dishes?! Try out these popular favorites! 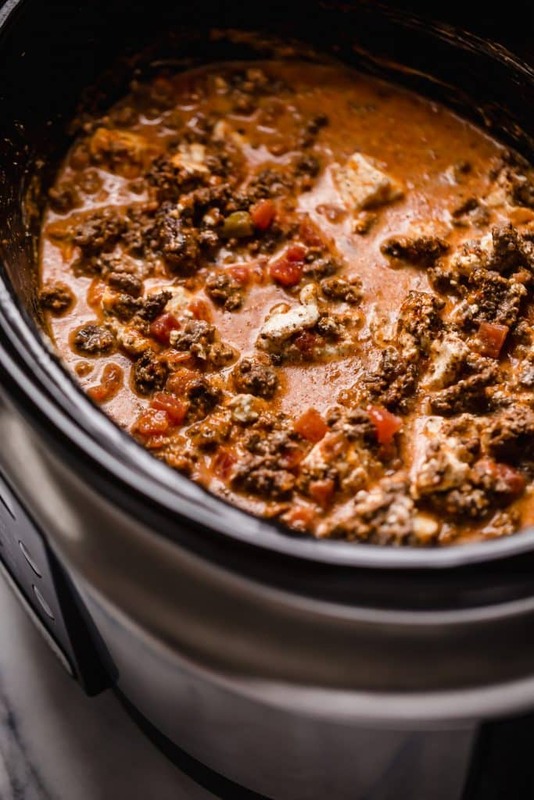 To slow cooker, add browned ground beef, cubed cream cheese, canned tomatoes with green chiles, chili powder, cumin, paprika, pepper, salt, and red pepper flakes. Stir to combine ingredients. Add beef broth and heavy cream and stir again. Set slow cooker to high for 4 hours. After cooking, stir mixture before transferring soup to bowls and garnish with desired toppings. Beef Substitution: In place of ground beef, ground chicken, pork, or turkey can be used. Storage: Store soup without garnishes in an airtight container in the refrigerator and eat within 5 days, reheating on the stovetop before eating; otherwise, store soup in an airtight contain without garnishes in the freezer and, before eating, thaw soup completely before reheating on the stovetop. The soup will stay fresh in the freezer for up to 2 months. Have you ever had success making this on the stovetop? Hi, Keely! 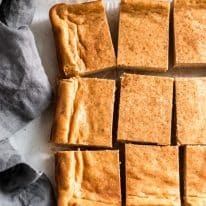 I haven’t tried this recipe on the stovetop, but I’d venture to say that you could cook it on medium-low heat for 1 hour and it’ll come out tasting delicious! If you go this route, I’d love for you to report back on how it went! ? I’m trying tonight! I’ll let you know!